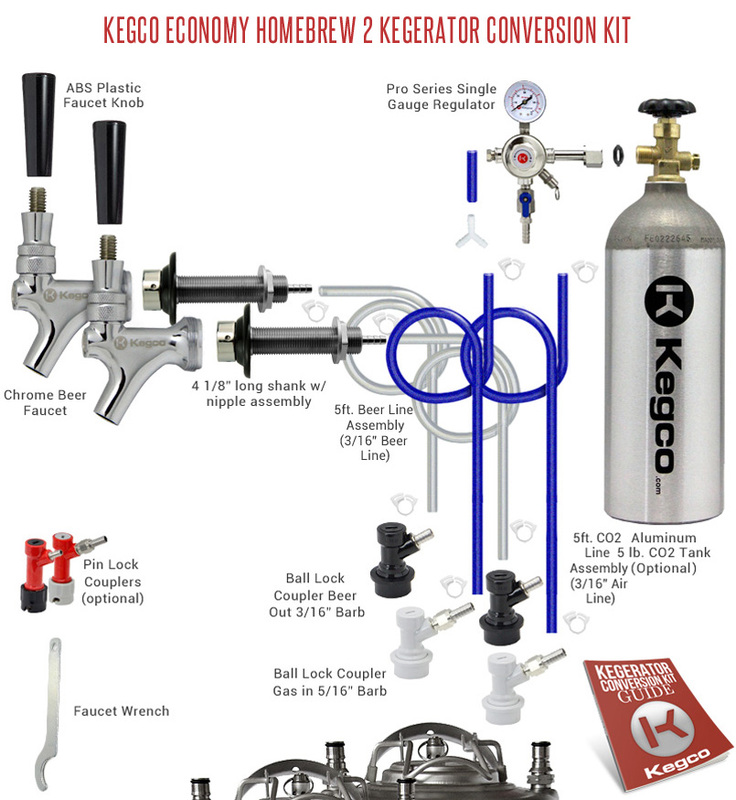 When you convert a refrigerator or freezer into a two product beer dispenser using the easy-to-use Kegco Economy Homebrew Two Keg Kegerator Conversion Kit, you'll be enjoying up to two different home brew beers on tap from your own kegerator before you know it! This kit comes complete with detailed instructions and all of the superior quality commercial-grade parts you'll need for a successful kegerator conversion, including an intuitive singe gauge regulator and your choice of ball lock or pin lock keg couplers. Depending on the refrigerator's capacity, your new kegerator should be able to dispense up to two home brew beer kegs simultaneously. This premium pro series single regulator features a Co2 gauge and a large hand control for easy monitoring and adjustment of Co2 pressure inside your keg. The chrome plated brass regulator has a manual pressure release valve as well as an integral tamper-proof safety pressure relief valve that releases at 45-psi. This complete ball lock home brew keg tap set includes both a gas in and beer out coupler for easy tapping of ball lock Cornelius Pepsi kegs. The gas in comes with a 1/4" nut and 5/16" hose barb already attached, allowing you to quickly connect it to the same size air line that standard draft beer regulators use. The beer out connector has a 3/16" hose barb that connects to standard 3/16" beer line. Essential for tapping pin lock Coke kegs, this complete pin lock home brew keg tap set includes both a gas in and beer out coupler. To allow you to quickly connect the gas in to the same size air line that standard draft beer regulators use, it comes with a 1/4" nut and 5/16" hose barb conveniently attached. The beer out connector features a 3/16" hose barb for connecting to standard 3/16" beer line. Warning:This product may contain a substance known to the state of California to cause cancer, birth defects or other reproductive harm.